Howard & Sons pyrotechnicians, designers and representatives are available to assist in the arrangement, management and production of your special effects and fireworks displays in Melbourne and all over Victoria. Specialising in larger events, but also available for smaller affairs, Howard & Sons pyrotechnicians can bring an arena, stage, park, harbour, rooftop or even community centre to life anywhere within the state of Victoria. Our pyrotechnics design department savours the challenge of working on or around city landmarks, marine environments, iconic buildings and challenging architecture, all of which are plentiful in the city and surrounding areas of Melbourne. Pyrotechnics extravaganzas from Howard & Sons light up not only the skies, but the most beautiful structures this city has to offer, and thousands of upturned faces. Working in urban areas carries its own challenges, as well as a myriad of triumphs. While special effects can leap from the surrounding infrastructure, a long list of strict regulations need to be met. With many years of experience in pyrotechnics-related legal aspects, Howard & Sons ensures its designers, pyrotechnicians and fireworks logistics teams always adhere to laws and guidelines from regulating bodies such as WorkSafe Victoria, Victoria Council and the Fire Authority. Naturally, all of our pyrotechnicians are fully licenced. We are proud to include countless mind-blowing New Year’s celebrations and Moomba festivals in our list of achievements, as well as the Royal Show in Melbourne. Fireworks and spectacular effects have also been fired between Geelong and Mornington Peninsula for Australia Day. Howard & Sons are specialists in the design of elaborate or simple but effective displays with or without multimedia, lasers, water screens, confetti cannons and many other types of explosive entertainment. 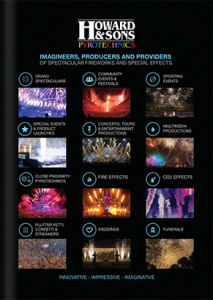 Give us a call today and see how our brilliant team of special effects designers and pyrotechnicians will make your event an occasion no one will ever forget. For all your display and product requirements in Melbourne and Victoria.